Except for a few shining examples, the Marathon community is largely devoid of Fan Fiction. I hereby invite all Marathon Fans to contribute their Fiction. All submissions will be anthologized, and the lucky winner will be professionally animated, scored, and voice-acted into a Marathon Fan Film. I could list a bunch of boring rules here, but really, just get your submission in before March 31, 2010, and it'll all be good. You can send in early drafts, too, and as long as you make it clear that it's not a final submission, I will take my editor's pen to it and send it back. Let's bring the Marathon community's characteristic professionalism to this contest. If you wrote one of those, you can enter it into my contest. Otherwise, it would just be a distraction right now. Here's a rough draft of my submission. IT IS NOT FINAL. Please edit it and let me know what you think. W'rk, looking at this, I like your story already, but maybe people who didn't read and reread Chilron as many times as I did won't be able to relate to the plight of the characters. 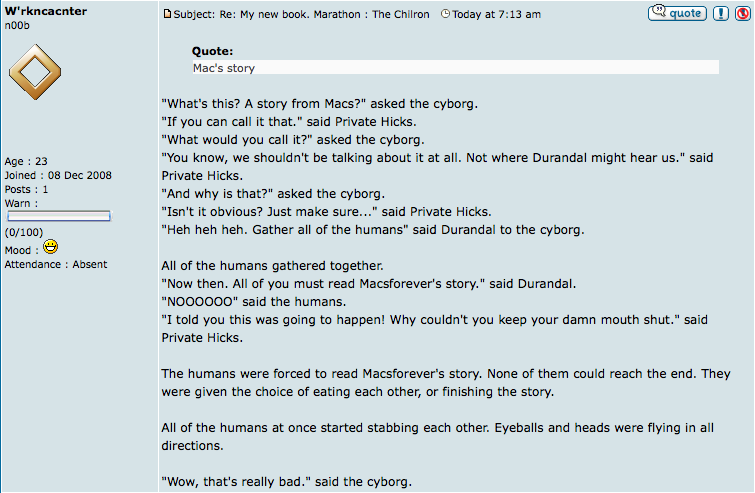 I think you should expand on the badness of Macsforever's story. Best Marathon Fan Fiction EVER! Ukimalefu, you can only submit stories you have written. Is it OK if I send my entry to you in a PM? That is acceptable, although I don't know what the limits on PMs are. My email is ray@the.ug if that's better. Can I write a fan fiction about patrick? I assume so, if it's canon. patrick is pretty much the definition of canon. irons wrote: patrick is pretty much the definition of canon. Looks like a pretty airtight case, irons, so go right ahead. OK ray, I've sent you it in a PM. It fitted alright. Congratulations W'rkncacnter on winning the Fan Fiction Contest! Awesome! I voted for him eight times!